Tommaso Maria Conca, who was born in Rome, trained under Sebastiano Conca (who was cousin to Tommaso’s father). Tommaso was elected as President of the Academy of San Luca, Rome in 1792-5. His major works there included frescoes (1775-80) in Villa Borghese and frescoes (1782-6) in the Hall of the Muses in the Vatican. 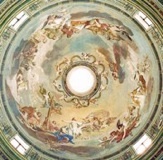 Tommaso Conca was called from Rome in 1795 to execute fresco the cupola of the Duomo, which had been largely rebuilt after the earthquake of 1789. This was to be the last major project of his career. He also worked in the transepts. Other works in the Duomo and elsewhere in the city are attributed to him. These frescoes depicts Christ, the Virgin and the patron saints of Città di Castello pleading with God the Father for mercy. These frescoes were designed by Ermenegildo Costantini, who was at work on their execution when he was almost killed in the earthquake of 1789. He fled to Rome and the work was subsequently completed, essentially to his designs, by Tommaso Conca. (These designs by Ermenegildo Costantini survive in the Museo del Duomo). •the martyrdom of St Crescentian. ✴The fresco in the tondo between the windows on the left depicts the bishop St Albert and his deacon, St Brictius, who were martyred in 711 AD. •the bishops of Perugia, Gubbio and Arezzo attend his last Communion. ✴The fresco in the tondo between the windows on the right depicts the Blessed Buccio Bonori, who was bishop of Città di Castello in the period 1358-74. ✴The main scene depicts a vision in which St Veronica sees the Madonna and Child and the young St John the Baptist in glory. ✴The lunette contains a depiction of the Annunciation. This panel in the Museo del Duomo, which is of unknown provenance, is attributed to Tommaso Conca. It is based on a panel (1771) by Tommaso Conca that that is now in the collection of the Accademia di San Luca, Rome. 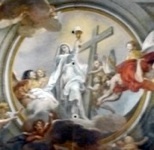 This altarpiece, which is attribute to Tommaso Conca, is in San Francesco. This altarpiece of the grieving Virgin is in Sant’ Ubaldo [where ?] An inscription containing the signature of Tommaso Conca was found on it during its restoration in 1994. A degree of over-painting was removed at this time, including a black veil on the Virgin’s head and a sword embedded in her breast. The inscription mentioned above also includes the date 1789, but this is probably the date of its installation in its present location: stylistic considerations suggest that it was painted some decades earlier. Tommaso Conca worked a number of churches of the Congregation of the Passion of Jesus Christ in 1766-92, and it seems likely that they brought this altarpiece to Sant’ Ubaldo from one of these when they moved there in 1787. Return to Art in: Città di Castello Gubbio. Return to “Foreign” Painters in Umbria.